The sister of my fiancé shows me her new "Underwater Florida" guidebook (an oracle for scuba divers in Florida) at a family Thanksgiving gathering. I stumble upon a mysterious, formerly-unknown (to me, at least) river in Florida. The river sounds so enticing that I am befuddled as to how it could have escaped my attention for so long. After several weeks of attempting it, I am still unable to pronounce it: The Chassahowitzka River. Chassa-witz-ka. 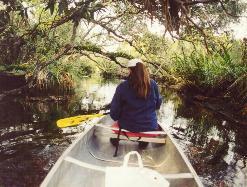 Located 14 miles south of Crystal River, the Chassahowitzka is fed by over a dozen freshwater springs. 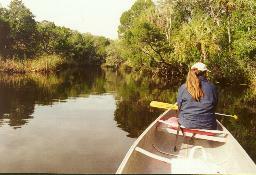 The river passes through the Chassahowitzka National Wildlife Refuge, established in 1943. The refuge includes 31,000 acres of saltwater bays, estuaries, marshes, and hardwood swamps, and can only be explored by boat. On a cool, wispy-cloud day, Maureen and I drive into the tiny town of Chassahowitzka, and soon find the county-owned boat launch, where we rent an aluminum canoe. Our paddle begins disappointingly. We are greeted, as we head out, by a noisy air boat as we paddle downstream. We arrive at a fork in the river, and are aghast at the hideous development crowded along both sides of the fork to the southeast. Instead, we head northeast and find a very pleasant, out-of-the-way fork that contains the "Three Sisters Springs." The springs are easy to see through the crystal-clear spring water. They are nearly perfectly round, about 4 to 6 feet in diameter, and about 50 feet apart. Their main shafts appear to be extremely modest in depth. The surprisingly attractive channel turns out to be a harbinger of what we will discover on this river of mystery and hidden delight. We finish lunch and head back out to the main river channel. The water is noticeably quite clear, and while quite shallow (probably too shallow to drift dive), is teeming with fish. Overhead, we notice that the air and trees are also home to an unusual number of wading birds and birds of prey. 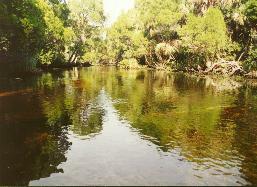 Even in this upstream location, the Chassahowitzka channel is extremely wide. Slowly, the secret, unknown pleasures of the river unfold in front of us. On both sides of the main channel, we come upon what appear to be impenetrable creeks feeding into the main channel. Of course! Motorboats, airboats, pontoon boats, speed boats, and freighters are unable to squeeze into these intimate little streams, but canoes and kayaks CAN! We pass through the tree-canopied curtains of one of these small waterways and enter a world that appears to have never been paddled or seen before. No boaters. No fishermen. No litter. Before us is a quiet, serene, peaceful setting for us to enjoy at a leisurely pace. We glide in our canoe as long as we can, which is unfortunately not very long since we must head home before sunset. It becomes obvious, from our maps, that the Chassahowitzka is fed by a large number of these clandestine creeks-undoubtedly their own spring-fed routes worthy of, on a future date, some paddling exploration. Upon reaching the boat ramp, we are treated to a manatee, which we pass over about 100 feet from the take-out point. The Chassahowitzka is a river of striking contrasts. A frequently-used main channel that is exceedingly average, yet a river holding many wildlife-rich surprises for the paddler seeking pioneering adventure.